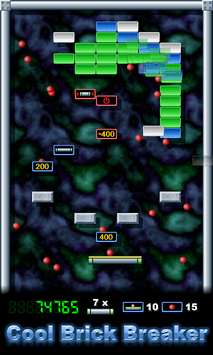 - Cool Brick Breaker is an addictive free game with great graphics and music that includes many items, bonuses and power-ups such as multiball, expand paddle, laser and much more! - Touch the screen to release the ball and move the paddle. - You can control the trajectory of the ball making it bounce on different parts of the paddle. - Press the Back or Menu button on your phone or tablet to pause the game. You can also enable a pause button in the Options menu. - Reduce the speed of the balls. - Increase the speed of the balls. - Give the player an extra life. 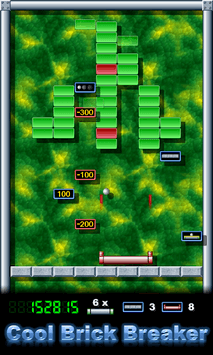 - Split each ball into three balls (multiball). - Add to the score the number of points inside the item. - Subtract to the score the number of points inside the item. - Temporarily obscure the level. - Temporarily make the balls do not bounce when destroying blocks. - Temporarily create a wall of indestructible blocks at the bottom. 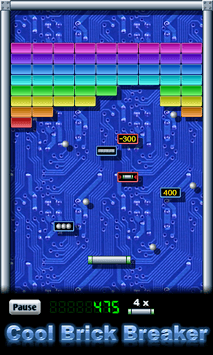 - Temporarily stick the balls to the paddle until the player touches and releases the screen. - Temporarily make the paddle shoots two lasers. If you enjoy other brick breaking games like Breakout, Arkanoid, Brick Busting, Break The Bricks, Brick Breaking, Smash Brick, Brick Breaker, Block Destruction or Brick Buster, you will love this cool game!